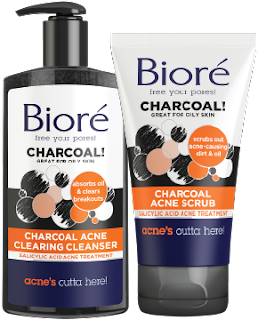 Bioré has long been around for the fight against acne. They first came on the scene with their famous blackhead strips around 20 years ago. Now they have a whole skincare line dedicated to fighting acne and oily skin that helps keep skin looking its best even when it wants to look its worst. It has the power of acne fighting ingredients that are some of the best on the market. Read below for my review of some of their newest acne fighting products. This scrub is great for combination skin and is great after cleansing or on its own. It contains baking soda and 2% salicylic acid to help treat and prevent acne lesions. The scrub itself does not contains any microbeads, so there is no worry there about harming the environment. Instead it contains microcrystalline wax for use as the scrubbing compound. The scrub foams to help cleanse the skin. Baking soda is wonderful at exfoliating the skin too. It deep cleans and gently exfoliates the skin. Salicylic acid is anti-bacterial, so it actually helps to prevent and treat acne lesions. Do not use if you have active acne lesions such as pimples and pustules. This scrub is better for whiteheads, blackheads and milia. It is a great scrub to have around during the summer months when skin gets oilier and needs more TLC. Personally, I love this scrub and now that the weather is warmer my skin is more combination than dry and this scrub is perfect for my skin. I like to use it in the morning before putting on makeup, to give my skin a nice glow. To use, wet face, squeeze product onto hands, massage over entire face, avoiding eye area. Rinse thoroughly. Use 2-3 times a week for best results or up to 2 times daily if needed. If your skin is oilier then the Charcoal Acne Clearing Cleanser and Charcoal Acne Scrub is for you. The Charcoal Acne Clearing Cleanser contains active charcoal powder and 1% salicylic acid to help prevent and treat acne lesions. It has skin purifying technology. Not only does it actually clear up acne blemishes, but it penetrates the skin to control acne blemishes and it helps prevent new ones from forming. This is great for oily and acneic skins. Use morning and night. Wet face, pump product onto hands, massage over entire face (avoiding eye area), rinse thoroughly and for best results use daily. This cleanser is nice because it cleanses without drying out the skin and it does a good job of purifying the skin. Even though I don't have oily skin, sometimes I do suffer from a few acne lesions during the spring and summer. I like to use an active charcoal cleanser because it makes my skin feel cleaner. The Charcoal Acne Scrub contains active charcoal and 1% salicylic acid to help prevent and treat acne lesions. It is best for oily and acenic skins. Not only does it actually clear up acne blemishes, but it penetrates the skin to control acne blemishes and it helps prevent new ones from forming. To use, wet face, squeeze product onto hands, massage over entire face, avoiding eye area. Use 2-3 times a week for best results or up to 2 times daily if needed. This scrub does not contain any microbeads but uses microcrystalline wax instead. It also foams a little bit to cleanse the skin. Salicylic acid is anti-bacterial, so it actually helps to prevent and treat acne lesions. 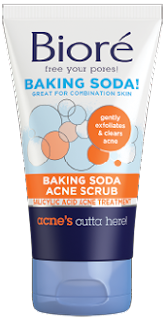 Do not use if you have active acne lesions such as pimples and pustules. This scrub is better for whiteheads, blackheads and milia. Even though it is for oilier skin and acneic skin, it could cause irritation and infection if it was used on active pimples and pustules. You have to be careful when there are active lesions present. I like this scrub a lot. It helps to really cleanse and purify the skin, making it feel squeaky clean. Bioré is available at mass market retailers such as Walgreens, Rite-Aid, CVS, Target and WalMart. It can also be purchased at Ulta Beauty and many other mass market retailers around the US. Like Bioré on Facebook: https://www.facebook.com/bioreskin; Follow Bioré on Twitter:@bioreus; Follow Bioré on Instagram:https://www.instagram.com/bioreus/; Subscribe to Bioré on YouTube:https://www.youtube.com/channel/UC4_KRggmX_xuZv8HqCohnHQ and Follow Bioré on Snapchat:https://www.snapchat.com/add/bioreus.